At Christmas, Ken showed up at my place with a truly horrendous beard. Naturally, I thought it was awesome, and figured I should grow an even worse one. 4 weeks later, I sent Ken a text message to find out the state of his beard, and discovered that he didn’t enjoy looking like a lunatic who’d wondered off from the nearby hospital, so he’d buckled and trimmed it. This however confirmed to me, that with some willpower, I stood chance at beating him. When I let him know my plan, he scoffed – called me a ‘copy-cat’, among other things and demanded an immediate photo. So, fueled by his displeasure, obviously I forged on. At first I was just going to take the photo right away, but being aware of the photo of him sporting his ridiculous beard and that even more ridiculous fur hat, which he posted on Facebook, I knew I needed to ponder my photo carefully – it needed to be epic. All of this got me thinking about how far away I am now from a habit like smoking, and really, in many ways I have cycling to thank. Sure, I was reasonably healthy before I started to ride, but if I’m honest, I wasn’t anywhere near as health-conscious as I am today. I wish I could say this was because of my own incredible, innate willpower, but more so, it comes down to the people I hang out with now. It’s just not cool to be unhealthy. When your friends are all bike racers, runners and cross-country skiers, always working to get fitter, faster, and yes, healthier, if you want to keep up at all, you’d better take care. I’ll never forget, going to a dinner party with some of my ‘new’ cycling friends. This was several years ago now. It was a going-away party and although it was a weekend and many people at the table had a beer or a glass of wine with dinner, that was it – everyone shifted to water after that. I remember finding this somewhat remarkable. But, each of them had good reason not to get totally corked, and to stay hydrated – they had their training and their health to think about. Now I don’t think twice about going to birthday parties or Christmas parties where everyone enjoys one or two specially chosen craft beers, and devours the veggie platter and homemade hummus first, while leaving the giant bowl of chips largely untouched. And, no surprise, no one is ever going outside for a quick smoke. 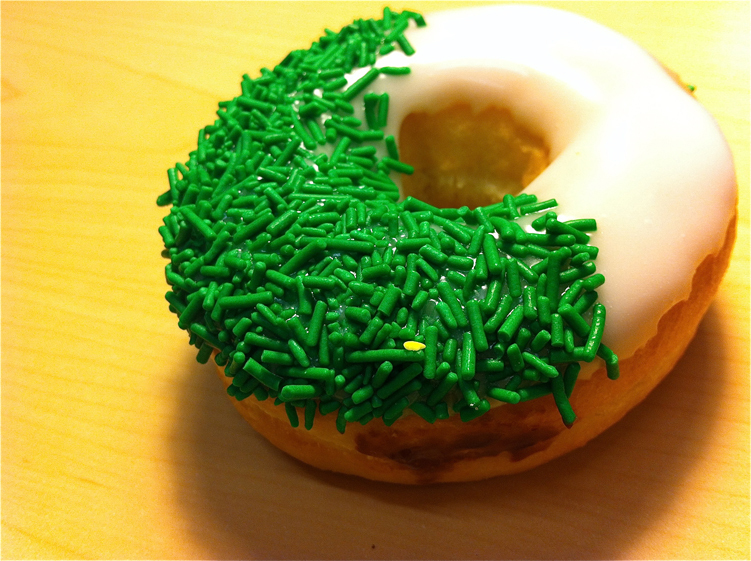 Mmmm… Donut with green sprinkles. My fav! Don’t get me wrong, I’m not describing a monastic lifestyle, devoid of any indulgence – far from it. I ate that donut while writing this afterall… There is, however, little question in my mind, despite the regimental hardships of mid-week interval sessions, remaining ‘mindful’ of your diet, the need to try and get a full night’s sleep on a regular basis, and all of that, I’m better off for falling in with this group. Where maybe some people would find it lame, beyond lame, to wave off the next round of pints, and chose to drink water at a party, or give up watching your favourite shows to go to bed at 9pm to ensure you’re fully rested for the day ahead, I know that at my age, now 38, it’s far too easy to fall prey to the weight of life, bills, work, kids, etc… It’s too easy to let the pounds just creep on, and allow the diet to shift from conscious healthy home cooking, to convenient take-out and frozen packaged dinners. I’m probably in some of the best shape of my life at the moment, and looking forward to somehow keeping it that way. If I could lend any advice to someone looking for a way to make a positive lifestyle shift and to better their health, I’d recommend making sure at least one of your circles of friends is into active lifestyle pursuits, be that cycling, swimming, running, team sports, whatever. You’ll find the motivation you receive from those around you, to change any bad habits, will certainly be helpful. If your goal is to get more active and improve your health, then surrounding yourself with only ‘un-active’ people, would be about as helpful as surrounding yourself with, say, donuts. Here is a good article that offers a pretty holistic approach on taking ownership of your health and overcoming the challenge of age. While you may think you’ve ‘beaten’ me, I fear you’ll never catch the gingerbeardman. Perhaps there needs to be a “beard” sub-category in cyclocross this season? I don’t know about you fellas but for me, I ride and race so that I can drink/eat/smoke/imbibe whatever I want without worrying that I’ll turn into some kind of slob. I attended a talk by famous architect/urban planner Jan Gehl last year and one of the things that has stuck in my mind was a slide he had showing someone smoking. He then went on to say (with stats to back it up) that if you cycle everyday for 30+min you can effectively negate most (not all of course) of the bad affects of smoking. I am not advocating smoking of course, I am just trying to point out that if you are active every single day you can realize massive benefits to your health – even if you train hard a lot. Case in point – me. Since going carfree 3 years ago and having to cycle everywhere for everything I have lost weight, inches on my waist, and have been feeling better than before when I drove everywhere and “trained” when I rode my bike. I don’t train anymore, just ride hard for fun, and over the last 2 season of cyclocross my results (and fun!) has gone up beyond what I’d ever expected. So, have that cigarette, pint (or 4), and bag a chips – just remember to be active everyday. Words to live by. Here. Here. Killer beard Sheldon. Don’t let Ken’s beard-envy get you down.. I dared Steve to grow a “Duck Dynasty” beard. He did okay for a bit & then caved and shaved it off. True story: Post shave, the ladies at the daycare asked if our son’s grandfather had been doing the drop off/pick up the previous week. No one recognized him beardless.